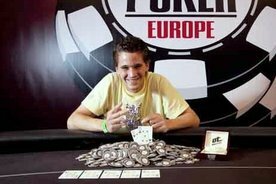 Barman Guillaume Humbert decided against heading to Vegas this summer to take part in his first WSOP but to wait and go to Cannes instead for the World Series of Poker Europe’s debut in south France. It turned out to be a good decision as the Swiss man took down the first of seven bracelet events, the €2,500 sixhanded no-limit hold’em tournament, for a payday of €215,999 ($288,899). The 26-year-old topped a field of 360 in his first major live tournament to become the first WSOP bracelet winner from Switzerland. He beat Azusa Maeda heads up despite Maeda holding the chip lead going into the final battle. It was Maeda’s first major live poker tournament cash as he, like Humbert, is more of an online player. If he made it to first place instead of the €133,471 runner-up prize, he would have been the first Japanese WSOP champion. Instead Switzerland gets its very first WSOP bracelet-wearing bartender. All eyes were on this event and not just because it kicked off proceedings in Cannes but because Phil Hellmuth was at it again. The 11-time gold bracelet holder was once more in search of his 12th and things looked good for a while with the American pro getting nearer and nearer to the official sixhanded final table. Hellmuth made it excruciatingly close receiving €24,183 for his seventh-place finish, and accumulating some WSOP Player of the Year points to help him in his race with current front-runner Ben Lamb. He now increases his lead as the player with the most cashes with this, his 84th, cash. Other well-known players who went deep included Casey Kastle (€17,790), Anton Wigg (€13,228), David Benyamine (€13,228), and Freddy Deeb (€9,936). After winning, Humbert said, "I can’t believe it. It’s amazing. This is my first live tournament. I can’t believe this has happened to me… I am going to put some of the money away so I can maybe open up some kind of bar business. But it is early to tell. I have not thought about that yet.